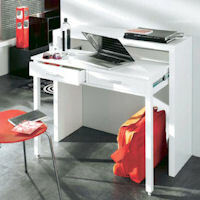 Space saving console desk which neatly and discreetly slots away for compact storage when not in use. 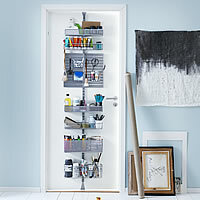 Neat wall mounted elfa solution to organise your crafty corner. FREE Design Service Available if this size is wrong for your available space! Wall mounted drop-down occasional desk. 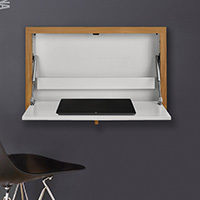 Crafted from white wood, solid oak and sheet steel this handy idea is fab. if you're short on space. 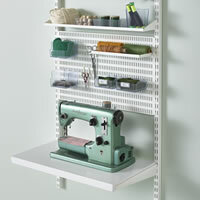 Modular shelving and desk unit to declutter and organise your craft room. Finished in solid birch or walnut FREE Design Service Available if this size is wrong for your available space! 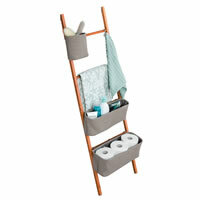 Bamboo storage ladder with 3 adjustable soft cotton totes and a storage hook. Comes with non-skid, non-scratch feet. 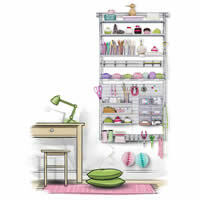 Neat wall mounted elfa solution to organise your crafty corner with plenty of hooks, storage trays and a desk area. An ideal storage solution for your craft room designed by our in house elfa design team. FREE Design Service Available if this size is wrong for your available space! Elfa door rack system to make the most of unused space on the back of a door.